So when Taj Gibson Wednesday in the Bulls anxiously awaited first game against former teammate Luol Deng got a defensive switch onto Deng, Gibson was ready. “Wow, Lu,” Gibson said he thought to himself. But there would be no “wow” moments for Deng nor the Cavaliers as Deng had a quiet 11 points while Gibson with 26 points matched a career-high and D.J. Augustin with 27 matched a season-high and the Bulls pulled away from a three-point game in the last three minutes to defeat the Cavaliers 98-87. Really remarkable in a lot of ways. The Bulls lose Derrick Rose, their star and leading scorer who is expected to be added Thursday to the list of players to try out for the 2014 World Cup and 2016 Olympics for USA Basketball. And then they trade Deng, their second leading scorer, for future considerations. Injuries remain and starters Kirk Hinrich and Carlos Boozer both were out Wednesday, Hinrich perhaps a week with a hamstring strain and Boozer day to day with a sore calf. So Gibson and Augustin step in and lead the team to victory, their ninth in the last 11 and seventh of nine since trading Deng, along with 22 points from Dunleavy, also a new starter with Deng gone. “One of things I respect about our team is they respond to every challenge,” said Bulls coach Tom Thibodeau. “They have a lot of heart. They play smart and play hard and play together. Each day they have the right approach, not looking ahead or behind but concentrating on what they have to do to win. We’re shorthanded. We understand how hard we have to play to give ourselves a chance to win. It is in many respects head scratching, geez type amazing, though you don’t celebrate at 21-20. And hardly with much support with Mike James, Cartier Martin, Nazr Mohammed and Tony Snell on a short bench which combined for four points and mostly served to give the starters some rest. But management despite the Deng move found Augustin, who has been little short of a savior in leading the team in scoring three of the last seven games and averaging 21.6 points on 58 percent three point shooting the last five games. Joakim Noah has continued his remarkable onslaught on the boards with nine points, 18 rebounds and six assists Wednesday, his 14th consecutive double figure rebounding game to be the most since Dennis Rodman 16 years ago. Augustin’s chemistry with Noah has been seamlessly impressive as working off one another they combined for several fourth quarter scores in the pick and roll, an Augustin strength. And then there’s Thibodeau’s relentless preparation and drive. Every season you can make a case for him as Coach of the Year, and this has to be another as the Bulls continue to roll up the most unlikely wins. No, they’re not playing the league’s elite. And they’ll get tougher tests in February. But not only not to lose the team after all that has happened and continues to, but to have them increasing their level of play is impressive. So in some respects it was no surprise to Deng treatment he got and the result. He just was on the other side this time. Augustin has been little short of a savior in leading the team in scoring three of the last seven games and averaging 21.6 points on 58 percent three point shooting the last five games. It was a frustrating night for Deng in many respects. He was barely part of the offense, shooting two of 11 and rarely involved. He was the kid who had to go onto the other side in the schoolyard to fill out a team and play against all his buddies. With the kids who already had a team. Deng and the players had talked about it for days, and Deng went over before the game to hug Thibodeau and some of the players and coaches. Afterward, it was like a greeting line and Deng rushing to catch the Bulls bus before it left the arena for one last farewell. No, he didn’t get to go this time. Nor fare as well. “I tried to really play the game within myself,” said Deng, who did look disengaged at times as it’s clear Cavs coach Mike Brown has no idea how to use him as yet. “I missed shots. I’m not happy with my performance. That’s a good defensive team. We’ve just got to keep growing. We’ve got a lot of stuff to work on as a team. I really believe that we can get there. We’ve just got to lock in. In terms of me, I could have played better. It would have hurt less if we got the win. Even if I shot the way I shot or played the way I played. Deng was asked if there was any resentment now being with a 15-27 team as the Bulls push themselves back into Eastern Conference contention. So the Bulls move on to another back to back this week concluding four games in six nights and then starting Jan. 29 a six-game Western Conference trip over 12 days. Jimmy Butler put in another 42 minutes chasing around Deng and just about everyone else who was hot. And if he’s been in a bit of a shooting slump who can blame him averaging 41.2 minutes in these 11 games and 44.6 in the last five with 50 and 60-minute games. But guys keep going down; there aren’t going to be blowouts. And Tornike Shengelia isn’t the answer. Who knows how long this can last. But don’t tell that to Thibodeau or these players. Noah has continued his remarkable onslaught on the boards with nine points, 18 rebounds and six assists Wednesday, his 14th consecutive double figure rebounding game to be the most since Dennis Rodman 16 years ago. One of them is Augustin, who hasn’t revived the Bulls three-point shooting game. He’s basically invented it. Not only with his shooting, but his clever play on the pick and roll that’s opened lanes for Noah, thus contracting the defense and providing better opportunities for everyone. Dunleavy essentially clinched the win with a three on a pass from Augustin with about 40 seconds remaining and the Bulls ahead by 93-87. Augustin, as he’s done so much lately, made the big shots down the stretch, a step back three with 4:40 left and the Bulls hanging on ahead 81-78 and another to stretch out the Bulls lead to 91-81 with 2:24 left. That last one came after Augustin cleverly found Noah rolling for a layup on their pick and roll with Noah finishing with a two-handed flush. “He’s very clever in the pick and roll,” said Thibodeau. ”Go under and he’ll make you pay (with the shot). He knows how to read defenses; he keeps the game simple. He makes quick decisions, makes the right play, hits the open man. It’s a great opportunity for him, but that’s the nature of the league. He needed us and we needed him. The fact is he’s already played very well in this league. He’s a very bright kid, very, very smart, picks things up quickly. Augustin was ready again after a brief pregame reunion when Deng came over to Thibodeau to offer a hug, not exactly a pose we often see with Thibodeau. We are more accustomed to midway through the fourth quarter when Kyrie Irving, who led the Cavs with 26 points, scored on an inbounds play to pull the Cavs within 79-76 on a 14-8 run in the first six minutes of the fourth quarter. Thibodeau was, you can say, vocal. 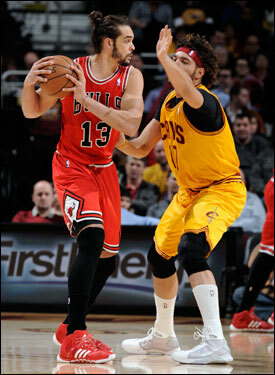 Noah as he was heading down court pushed his both hands down in a “settle down” instruction. But in the next timeout Thibodeau was calmly going through a defensive set that led to a steal and Noah run out for a dunk and 81-76 lead. It seemed every time the Bulls needed a play they made it while the Cavs stumbled. The Bulls made the Cavs look feckless, though it was disappointing to hear Brown pretty much blame everyone else. Actually, the Cavs did play with energy. 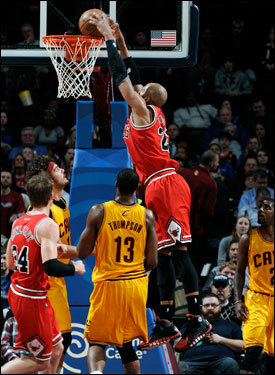 They were one of the few teams to dominate the Bulls on the offensive boards 19-7 and in second chance points at 19-6. There were multiple occasions when the Cavs grabbed two and three offensive rebounds leading to scores. But what you see in the Cavs is an undisciplined offensive team with a lot of individual play, a team where it’s difficult to see Deng be effective with his subtle game and such an unimaginative offense. The Cavs couldn’t get much of anything going early as the Bulls scored the first seven points and led 23-17 after one. Thibodeau had to go with early substitutions of Mohammed and James. And though they didn’t score at the time they ate up minutes and Thibodeau said that late first period early second was crucial to get the starters rest. Deng admitted it’s been a change for him to get accustomed to the Cavs’ different defensive scheme in which they blitz the pick and roll with a big man like the Heat do compared with the Bulls pushing it to the baseline and help. It didn’t help the Cavs much as the Bulls shot 52.9 percent. 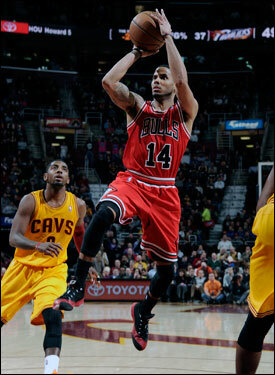 Augustin got the Bulls offense to that fast start with eight first quarter points, though Irving took advantage some. Hinrich generally gives Irving trouble with physical play. Augustin was going under the screen in the first half and Irving made all five of his threes in the second quarter as the Cavs had a 9-0 run on a trio of Irving threes and led 44-43 at halftime. The half closed with a Noah tip dunk and a stop against Anderson Varejao, who had seven offensive rebounds. The Bulls thus regained control midway through the third quarter with Gibson continuing one of the best runs of his career with 12 third quarter points on a series of baseline jump shots and strong inside moves after nine points in the second quarter. Dunleavy and Augustin contributed threes in the midst of Gibson’s run and the Bulls headed into the fourth quarter with a 71-62 lead. The Cavs made it another struggle with a 10-2 spurt after Dunleavy opened the fourth with a three. But then it was big play after big play to match and hold off the Cavs in the fourth as the Bulls have been able to do the last few weeks. “People don’t understand when you start and come off the bench,” said Gibson, who is averaging 19 points and 9.2 rebounds in his four starts. “It’s a totally big difference. Coming off the bench, you have to be ready, locked in. You’re stiff. You have to be just ready to jump in the game right away. When you start the game, you already have a nice sweat going. You’re just ready to go. The sky’s the limit when your teammates believe in you. The way I felt after the Lakers game (three of 11 shooting) is I had a lot of easy jump shots I normally make and they wouldn’t roll in for me. I just went into the gym, put a lot of effort in and tonight came back and knocked them down.